I've run this twice before, but since it's Angela's birthday today, it's worth repeating! Everybody remembers where he was and what he was doing at some significant moment in his life. For example, everybody my age remembers where he was and what he was doing when he heard about the assassination of John F. Kennedy on November 22, 1963. As for me, I also remember another day with startling clarity. It was January 27, 1969, when my daughter, Angela Antoinette Crider, was born in St. David's Hospital in Austin, Texas. In those days, in what I now think of as a more genteel and civilized time, fathers weren't allowed into the delivery room. Now, of course, they are, and they later invite friends and family over to the house for the showing of the full-color sound video they made of their children emerging from the womb. While I'm sure that's very enlightening for all concerned, I was quite happy to be shunted off to the waiting room to sit with other nervous fathers-to-be and wait until Angela was born. So what did I do in the waiting room? I read a book, naturally, and I remember exactly which book it was: File on a Missing Redhead by Lou Cameron. A Gold Medal Book, as you might have guessed. The other day on Angela's 36th birthday, in a fit of nostalgia, I pulled the book (sure, I still have it) off the shelf and read it again. It was pretty much as I remembered it. Short, fast, and twisty. The narrator is Frank Talbot, a state trooper, which is kind of unusual when you think about it. He's investigating the murder of a redheaded woman found crammed into the forward trunk of a VW Beetle, and in the course of things he gets involved with the skip-tracing agency for which his former girlfriend (Hazel Collier) works. Hazel, as it turns out, dumped Talbot because he sent her current sweetie to the state pen. There are lots of entertaining details about skip-tracing in the novel (probably all outdated now, what with the Internet), and lots of nice CSI type stuff (also probably outdated). Plenty of procedural details, too. The violence is gruesomely described. It turns out that the suspected killer of the redhead is being helped out by one of the agency's former workers, who knows all the tricks of the trade. And someone's trying to assassinate Talbot. All this is wrapped up (maybe at a little too much length) in a surprising way. It even surprised me this time, on my second reading. And the final couple of pages were just great. I remember how much I liked them 36 years ago, and they're still satisfying today. Definitely not what you'd expect. Cameron went on to create (and write a lot of books for) the Longarm series of adult westerns. I hope it made him rich. Angela will never be able to exercise a woman's perogative and lie about her age now. /As for me, I'm 39 for the, uh, 14th time. Great nostalgic post! The late David Rose sent me this and a couple of other Cameron books and I enjoyed it too, back in the 80's. One should have no shame in surviving...and, hey, the bloody videos, or a novel with a cover that almost has a giant gun coming out of a naked woman at about the point a newborn might emerge...what could possibly have led you to pick up that paperback rather than another that day? All told, a lovely if distracted way to remember a book. RIP, Lou Cameron, and many more (36th and otherwise) happy anniversaries of 27 Jan (two days after and two years before my brother's 1971 bday, a little less than two years before Alice's parturition, and about 4.5 years after my own debut as an airbreather) for all you Criders! Did you do the cigar thing back when? I've read a couple of articles and essays now on how the rapidly-changing technology is making it more difficult to write crime fiction plots (almost impossible to be somewhere with no phone access, for instance). That's also why historicals are a growing and popular sub-genre for authors. Of course, for those of us who aren't 20 anymore, it's a little painful to realize someone writing a novel today that was set in 1969 would be writing a "historical" novel. Redheads seem to figure more prominently than their numbers would indicate in crime fiction. They have, after all, a reputation, atop their simple rarity. Hence, attraction. I see the comments here are from a previous time you ran this review--at least my comment above is because I am now 39 for the, oh, 20th time. And Happy Birthday, Angela! You don't look a day over the 36 you were then. Happy Birthday, Angela! May you enjoy many more! 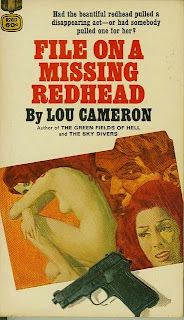 Lou Cameron had another career as a comic book artist, before he turned to writing. Did many Classics Illustrated & a lot of pre-Code horror comics. Multi-talented guy. Check out Google Images and see. Love nostalgia and that was a quick but good sharing of the story. Posted at 2 a.m.? Phew! You're keeping late hours; I do that sometimes when I deep into my thoughts as I paint or when the characters in my head won't quit telling me what to write until I get a scene inked onto the paper. Cameron's THE BLACK CAMP, THE FIRST BLOOD, THE BIG RED BALL, THE GREEN FIELDS OF HELL, and DROP INTO HELL are fine, gritty, cynical WWII novels, much in need of resurrection. John Hurt, R. I. P.
Barbara Hale, R. I. P.
Happy Birthday, Angela Crider Neary! Mike Connors, R. I. P.
Ronald 'Bingo' Mundy, R. I. P.
Butch Trucks, R. I. P.
Mary Tyler Moore, R. I. P.
A Big Day for Harry Stephen Keeler Fans!